In large saucepan, melt butter. Saute garlic over medium heat for 1 minute (until garlic tender). Remove from heat. Stir in flour, blend until smooth. Return to heat and gradually add half and half. Stir in cheese. Heat until sauce thickened and smooth. Filling: Start off by putting your bacon in a cold oven on a foil covered baking sheet, turn oven to 400 degrees. Cook for 15 or so minutes, checking frequently. You want it to be crispy but not burnt. While bacon is cooking, prepare all of your vegetables, chopping the onions in to fine pieces and cutting the tomatoes as small as possible. The bell peppers can be a fairly good size depending on your own preference, I love having large chunks. Remember to keep an eye on the bacon. Using either a spoonful of the bacon grease or simply use some olive oil, once again depending on taste, and saute the onions for about a minute. Add the bell peppers and the chicken and cook over medium high heat. After the chicken has warmed through go ahead and throw in the tomatoes. By now the bacon should be done, take it out and let it cool and drain on a paper towel. Get out a baking sheet and unroll your croissants. Make sure you turn your oven down to 375 now and let it cool off to the right temperature. The bacon should be cool now, so go ahead and crumble it into the chicken mixture and stir it up. 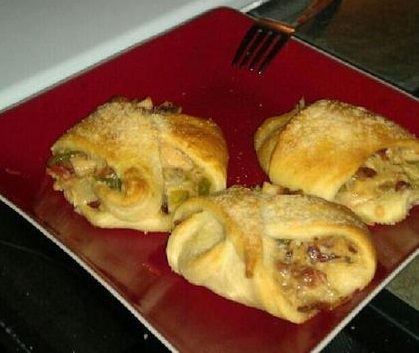 Take the chicken/bacon mixture and use a tablespoon to spoon the mixture into the middle of the croissant. Here you can either fold the croissant traditionally so it’s more of a roll, or what I did (to keep the filling in) is fold in both sides of the triangle into the middle of the croissant. Bake for about 15 minutes until a warm golden brown. Croissant should be flaky! Enjoy!